Can you cook up carbon, time and money savings with your pasta? We are not convinced. We're always on the lookout for gadgets to make cooking easier and more fun, and sometimes to save energy too. This was one that Jean saw on QVC in 2008, and brought into our lab ... ahem ... kitchen ... to test! We still haven't yet worked out if this gadget does indeed save energy and thus CO2, but we think that by avoiding the need to keep a pan boiling it probably does. Stopped using after a while partly because it is very difficult to get cooking time right/consistent. 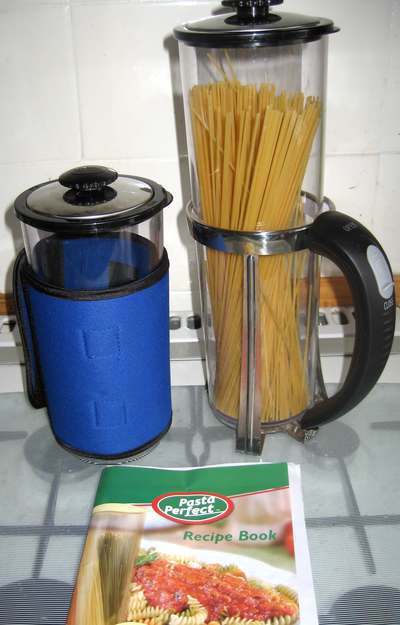 Pasta Perfect Set of 2 Pasta Pots with Thermal Wrap And Recipe Book #827106. I saw this advertised on the cable company QVC (www.QVCUK.com) - Pasta Perfect Set of 2 Pasta Pots with Thermal Wrap And Recipe Book Item Number: 827106 (YD-808). It was the pick of the day so was at a reduced price. This was my first purchase from them, and I was intrigued to see what the benefits were compared to boiling pasta on the stove: would it work? You get two plastic containers, one large and one small, a cover, handle, thermal sleeve, handle bracket, strainer and holder locker. You also get a recipe book. It comes with full instructions on how to assemble (which is easy). Both the pots have thermal lids to keep the contents hot; you can use the sleeve to pick up the container when you drain. 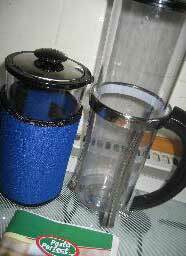 It's very easy to use; you warm the container with some warm water first and then empty. Add the pasta into the container as much as you need and then fill the container with boiling water about 1/2" from the top. I found I had to leave the pasta for a bit longer than the packet says, as I found it not properly cooked. Test the pasta before straining to make sure it is cooked. Once cooked take the lid off and use the self draining lid. You can add sauces directly to the container, put the lid back on and shake. All removable parts can be washed in a dishwasher. The large container can also be used to store long pasta when not in use. You could take the smaller container to work with you and just add boiling water when you need to. You can cook vegetables in this way as well; there are a few recipes in the book. I found this good to use when I was busy in the kitchen or attending to my daughter as I could leave the pasta cooking without worrying about boiling water or if it would over cook if I left it too long. I probably will only use this for pasta. It's a shame that it doesn't cook pasta in the same time as you would in the normal way, but it's a good product. I've found that I am making less pasta and not using this device at all, partly because it is very difficult to get cooking time right/consistent. First published 2008-03-09 , updated 2019-04-22 . Site copyright © 2007-2019 Damon Hart-Davis. Hosted by ExNet.